She was the first of our children to get married, and – just like in Sarjo’s case – we are paying the school fees for her eldest son, Sanusey, who has finished nursery school and is going to primary school now. By sending school materials and toys we are trying to upgrade his school as a whole. Especially primary schools are generally not very well- equipped for giving a proper education. In actual fact, there is a constant lack of the most elementary provisions, like having pens, pencils and workbooks for the pupils and pieces of chalk for the teachers. 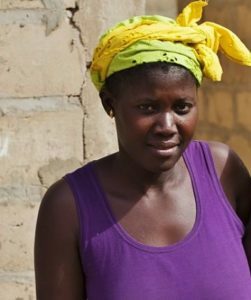 In May 2010, we gave Fatou ten bags of cement and a lorry load of sand (called a ‘trip’) for the reconstruction of the compound (house), which had started to subside and crack because of all the water in the rainy season.